Drench lips with shine, moisture and high impact colour. 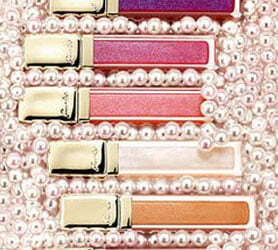 The Guerlain lip gloss collection offers beautiful pigmented colour and care all in one luxurious package. Each non sticky Kiss Kiss lipgloss comes in a variety of texture and colour, from shimmer to pearlescent, matte to satiny. Lips appear more full and plump thanks to innovative ingredients, and are dressed with a mirror shine that looks beautiful.